AutumnWood at Brooktree is a 55+ community located in Tacoma, Washington. Situated 40 miles south of Seattle, this active adult community is a wonderful option for homebuyers who want to live in a quiet subdivision yet remain close to a vibrant city. Designed specifically for active adults, this community offers single-family homes with low-maintenance exteriors. Residents enjoy many outdoor amenities while embracing the mature trees and wildlife that surround the community. Here, homebuyers relish in all that the community has to offer from affordable homes, a friendly environment, and an active lifestyle. Although there is not a clubhouse within AutumnWood at Brooktree, residents enjoy many outdoor amenities. Those who love some friendly competition will enjoy the horseshoe pits. Staying active is also made easy with the walking and biking trail that winds throughout the scenic community. In addition, residents can utilize a picnic area, pet park, gazebo and a playground for when grandchildren visit. Holland and Sons began construction of AutumnWood at Brooktree in 2007 and upon completion the community will have 128 single-family homes. This community offers four models that range in size from 1,482 to 1,883 square feet. Most homes have two to three bedrooms, two bathrooms and an attached two-car garage. Some features of these beautiful homes include stainless steel appliances, granite countertops, and fenced yards. They are built and designed to provide residents with high-quality homes so that they can enjoy a low-maintenance living experience. This 55+ active adult community provides a lifestyle that homeowners desire. Residents appreciate the laidback and carefree environment while not having to worry about the maintenance of their homes. Beautiful trees and wildlife surround the community, providing a setting away from crowded places, yet still accessible to all attractions nearby. With neighbors who share the same hobbies and lifestyle, it's easy to make lifelong friendships. Homeowners also regularly gather for games of horseshoes and for community picnics. This 55+ neighborhood is located in Tacoma, Washington in beautiful Pierce County. The community is conveniently located near shopping, dining, and recreational activities. Nearby, residents can shop at the Puyallup's South Hill Mall, Costco, and Walmart. Residents will be happy to know that the MultiCare Good Samaritan Hospital is less than 20 minutes away from the community. Some of the popular attractions throughout the surrounding area include the Broadway Center for the Performing Arts, Chihuly Bridge of Glass, Destiny Harbor Tours, DuPont Historical Museum, Emerald Queen Casino, and Fife History Museum. Those who love to be outdoors will love the proximity to Mount Rainier National Park, Point Defiance Park, Metro Parks Tacoma as well as the wide variety of golf courses. 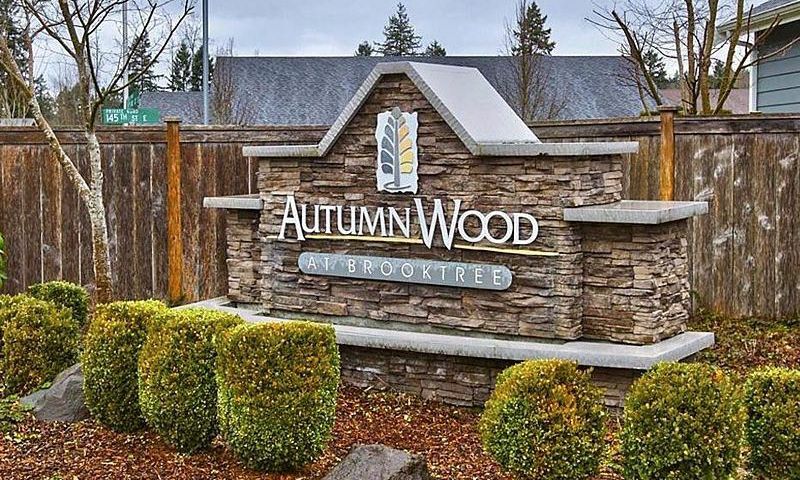 AutumnWood at Brooktree is a tight-knit community that combines low-maintenance homes and a carefree lifestyle in a quiet, yet convenient setting in Western Washington. Check back soon for more information on the lifestyle in AutumnWood at Brooktree. Holland and Sons began construction of AutumnWood at Brooktree in 2007 and the community now has 128 single-family homes. AutumnWood at Brooktree offers four models that range in size from 1,482 to 1,883 square feet. Most homes have two or three bedrooms, two bathrooms and an attached two-car garage. Some features of these beautiful homes include stainless steel appliances, granite countertops and fenced yards. They are built and designed to provide residents with high-quality homes so that they can enjoy a low-maintenance living experience. Please Note: Floor plans are not available at this time. 55places.com is not affiliated with the developer(s) or homeowners association of AutumnWood at Brooktree. The information you submit is distributed to a 55places.com Partner Agent, who is a licensed real estate agent. The information regarding AutumnWood at Brooktree has not been verified or approved by the developer or homeowners association. Please verify all information prior to purchasing. 55places.com is not responsible for any errors regarding the information displayed on this website.